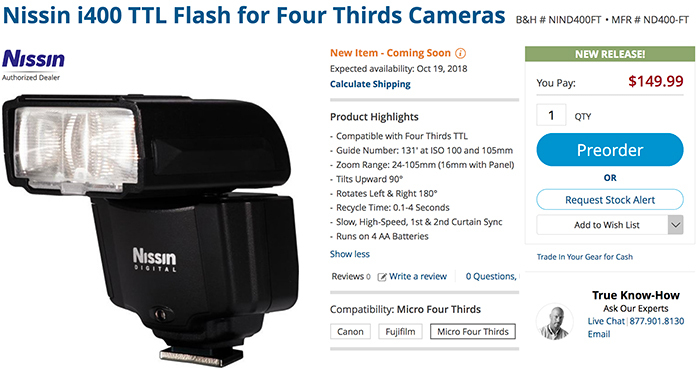 You can now preorder the new Nissin i400 TTL Flash for Four Thirds at BHphoto (Click here). The Nissin i400 TTL Flash for Four Thirds cameras is a simple but powerful compact flash designed for use by both pros and enthusiasts. It features TTL functionality and a guide number of 131′ at ISO 100 and in the 105mm position for providing coverage within a zoom range of 24 to 105mm, or down to 16mm with the built-in wide-angle diffuser. The shoe-mounted flash head tilts upwards 90° and rotates 180° in both directions for complete 360° coverage.